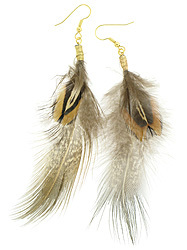 Feather earrings are just what you need to get in touch with nature. 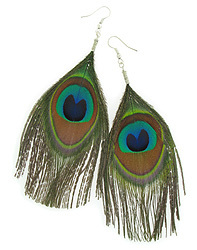 Go ahead and express your wild side! 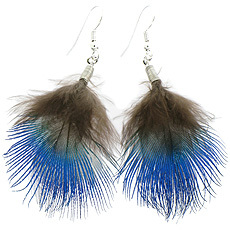 Be unique and make a statement with our dyed or natural feather earrings. 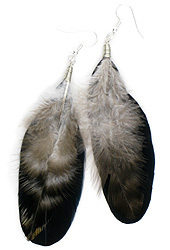 You can be sure that when you buy Arte Designs Feather Jewelry, no birds are harmed and you'll always receive beautiful and unique fluffy feather earrings with exceptional workmanship. 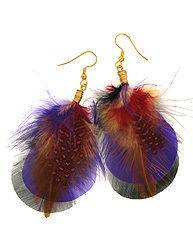 Real Feather Earrings made from Peacock Feathers, Ringneck Pheasant Feathers and more - Shop for a single earring or buy them as a pair. 1. 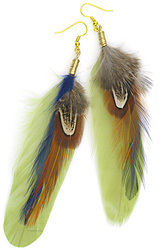 No birds are harmed and no exotic bird feathers are used (unless they're molted from my own parrot). 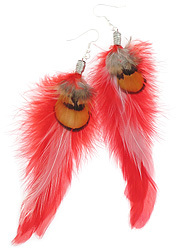 After a great deal of research, I finally found suppliers that support the ethical treatment of birds. There is no need to harm birds. 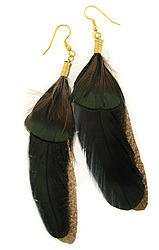 They naturally molt their feathers to replace old or damaged ones. 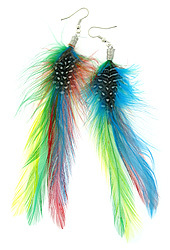 This can limit my inventory supply, but I prefer to wait than to harm birds. 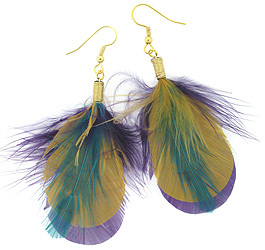 I own a Yellow-naped Amazon Parrot and love birds. I would never harm them or profit from someone else harming them. 2. 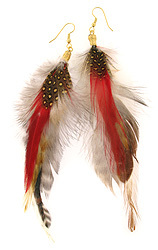 Collected feathers are professionally cleaned and disinfected. 3. 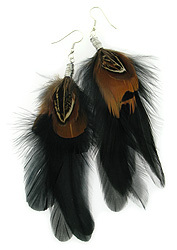 Since natural feathers are one-of-a-kind, there will be slight variations in color, size, and shape. I match them up as close as possible and spend hours sorting through them, discarding the bad ones and matching up the beautiful fluffy ones. 4. 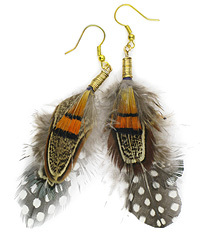 Each earring is tied together by hand, tape wrapped, then glued for durability. 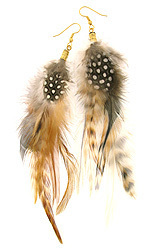 Quills can bend or break, so skipping this step can cause the feathers to fall out. 5. 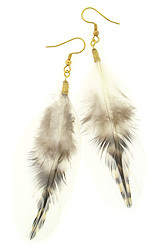 Final designs are then hand wrapped with tarnish resistant silver or gold wire for a finished look (no crossed wires). 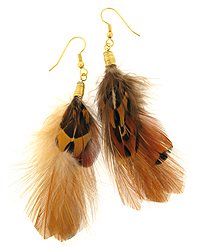 No unsightly crimp beads or flying tying are used. 6. 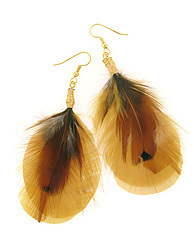 All feather earrings are handmade by me, so I am able to offer custom made pieces. 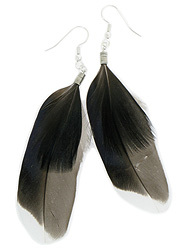 You can choose a single earring or a pair, type of metal, and length preference. 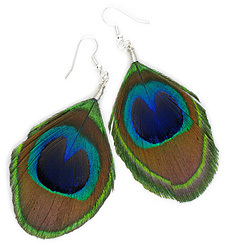 Average price range is $18 to $25. 7. 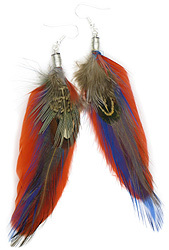 Arte Designs has been in business since 1999, is one of the first to offer a wide variety of handmade feather earrings (Made in USA), and has sold to 26 countries and counting. My workmanship has been perfected through experience. 8. 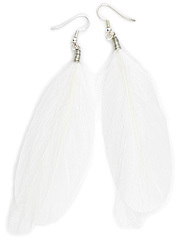 Not only are my long feather earrings made with exceptional care, but they have also caught the attention of Hollywood and the fashion elite. 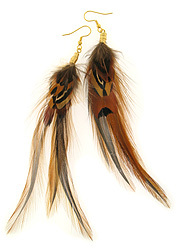 Arte Designs feather jewelry has been seen on hit TV shows, worn on celebrities, fashion designers, fashion magazine editors, and featured in Lucky Magazines. 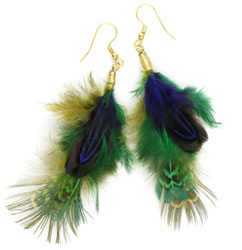 Feather Earrings, Peacock Feathers, Long Feather Earrings.